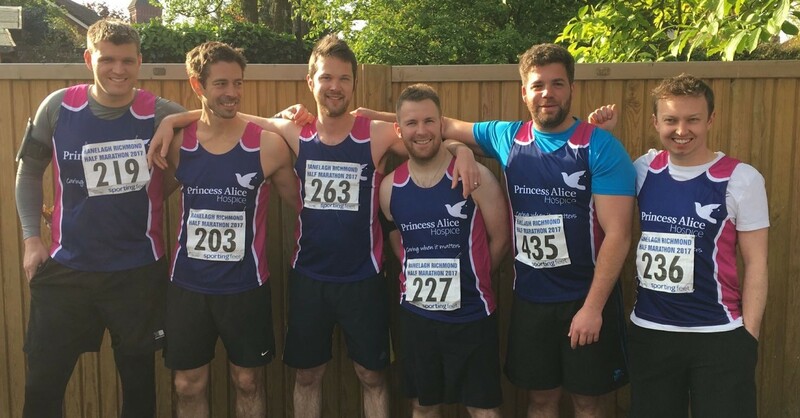 Whilst most people were tucked up in bed enjoying the lazy bank holiday weekend, six of our surveyors were up at the crack of dawn ready to take part in the Ranelagh Harriers Richmond Half Marathon, raising funds for our chosen charity Princess Alice Hospice. The 13.1 mile course encompassed a scenic, flat, multi-terrain route which followed the River Thames on the roads and towpaths of Richmond, Twickenham and Kingston. The weather was thankfully on their side with gorgeous sunshine allowing the six hundred and fifty-eight runners to take in the views of beautiful Richmond Royal Park and historical Hampton Court Palace as they ran past. All six runners (Chris Leone, Jack Nowicki, Justin Bamford, Liam Brown, Paul Fitzpatrick and Will Gatford) completed the half marathon in impressive times varying from 1hour 27 minutes to 2 hours 9 minutes. With the team training together during lunch breaks, after work and at weekends we knew they were committed and going to support each other over the finish line. Later this year Quantity Surveyor and pro-runner Justin will be competing in the Ironman UK with a monstrous route comprising a 2.4 mile open lake swim, 112 mile cycle through the Lancashire countryside followed by a full 26.2 mile marathon through the town centre. We suspect that this half marathon was a mere walk in the park for Justin!!! Well done Team for yet again challenging yourselves and raising funds for a wonderful charity.